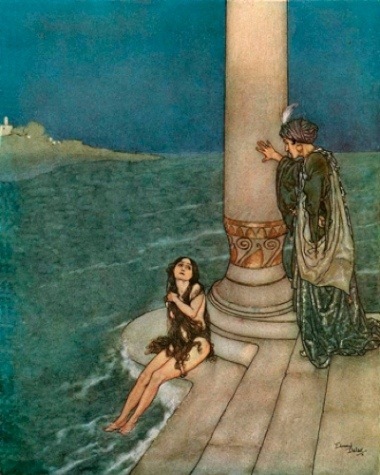 There is a story by Lord Dunsany called “Poltarnees, Beholder of Ocean.” It is about an idyllic place, a place of safety and comfort where no one is content, or at least very few are. On the one hand I suppose this is a story of discontent and the harm that it can do, but on the other, the more significant hand perhaps, it is about forsaking comfort and the illusion of contentment for what provides true satisfaction to the soul and spirit. In the story it is the ocean that everyone that leaves is seeking, but it could be anything. This suggests a question that each ought consider. Where is contentment found and what does it look like? The song, The King of the Fairies, is by Alan Stivell. He is credited by some with re-popularizing the Irish Harp, though he does not play it on this selection. I first heard of him while taking a course on the Irish Renaissance while I was in college in 1975. Stivell is from Brittany, or the Irish province of France. The music of Stivell and others like him fed and cultivated my interest in Celtic myth and folklore, of which Arthur, the Irish story The Tain, and the Welsh stories of The Mabinogion were a part. These stories share a world in common, one in which the natural and the supernatural interact with one another and in which magic and wizardry are somewhat commonplace. In the Arthur stories Merlin is a difficult character to reconcile to the Christianity of the time when they were written down. He is a wizard and wizards are of the devil, but he is also a wise and trusted councilor and everyone in the stories trusts him, even as they are calling him a “son of the devil.” The stories also revolve around heroic characters and the adventures that befall them. They are exciting reading. 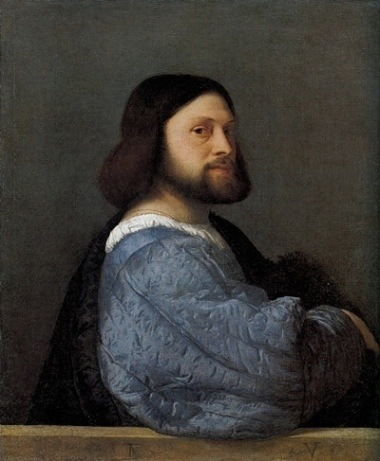 The painting is, according to some, of Ariosto (others say it is a self-portrait). Ariosto’s epic Orlando Furioso is also an important story for me because it caters both to my enjoyment of comedy, satire, and farce and the heroic stories mentioned earlier. It has been recently translated anew into English by David Slavitt. The characters in the story have an epic pedigree and they act as would be expected based on that pedigree. But this pedigree and the order of knighthood in general are also mocked and hence the irreverent humor. It too is exciting reading. Earliest known portrayal of Thomas Becket’s murder in Canterbury Cathedral. 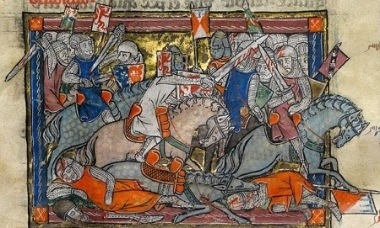 The paintings above and below are from medieval illuminated manuscripts. 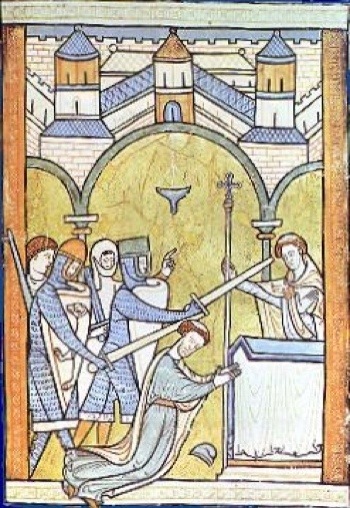 The one above depicts the assassination of Thomas a’ Becket. 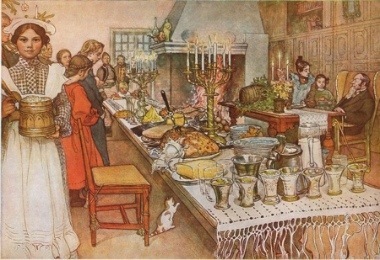 The one below depicts an episode from one of the King Arthur stories. These images evoke the political intrigue of the Middle Ages and its conflicts between Church and State (some things do not change) as well as the heroic tradition of its story telling. There is a passage in the “Prologue” to The Canterbury Tales where Harry Bailey (though he has not yet been identified by name) says to the pilgrims “We are all free men.” The Canterbury Tales is a book written at the end of the 14th century, barely a hundred years since the final version of The Magna Carta was issued, and it is the first instance I am aware of (though I would not be surprised to learn there are earlier instances) where the commons claim equality with the church and aristocracy and in truth I am probably reading this line within a 21st century context and perhaps Harry does not see himself in as free a light as I do. I wonder, though, at times if the equality that Harry speaks of is the beginning of a new tradition, a more realistic tradition, that is a bit at odds with that of Medieval Romance. There was an article in The Guardian over Christmas about science fiction, “Stranger than science fiction,” that wonders if our present interest in science fiction is not an attempt to escape the limitations of realism, that is “stuck” with things as they are and often offers few suggestions as to how to live harmoniously with things as they are, other than pretending perhaps that things as they are aren’t so bad. Science fiction also offers us a kind of story telling that is not just “lifelike” but often much larger than life and it is this something larger that readers also find attractive, they want to loose themselves in a world that is more heroic than mundane. The article suggests that it is important to identify the kind of story in which we would like to live or ought to live. The world of the 21st century offers many stories that though they may not be in conflict with each other are often more interested in selling us something, from products to points of view, than they are with helping us learn to live with ourselves, with others, or the world around us. Leading up to Christmas there were also some articles in The Guardian about favorite Christmas stories. Two caught my interest; they were about The Lion, the Witch, and the Wardrobe by C. S. Lewis and The Dark Is Rising by Susan Cooper (“Season’s Readings: The Lion, the Witch and the Wardrobe by CS Lewis” and “Season’s readings: The Dark Is Rising by Susan Cooper”). I read and enjoyed these stories as an adult and their use of myth and folklore (Greek and Roman myth by Lewis and Welsh myth by Cooper) nourished an interest I have always had in myth and folklore and the power of the stories that they tell. The Cooper story especially, with its use of motifs from The Mabinogion fed my interest in things Arthurian. But these were not the stories that provoked my interest initially. 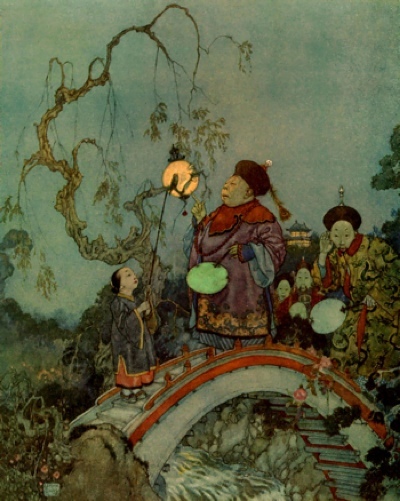 Above and below are illustrations from children’s stories. Like the illuminated manuscript images above, these help create a world, a magical world, that evoke the stories they illustrate and pique the imagination. Also as was true with some medieval illuminations they help tell the story to those who cannot yet read. When I was in the seventh grade my school gave students the opportunity to purchase books through the Weekly Reader and the Scholastic Book Service. One of the books that I bought was Eleanore Jewett’s book The Hidden Treasure of Glaston. I do not remember much of the book but its opening made a strong impression as well as its use of the Grail legend. The story revolves around a young boy whose father has left him with the monks of Glastonbury (one of the alleged resting places of King Arthur). His father is a knight who has been implicated in the murder of Thomas a’ Becket and must flee the country. The boy, though, is bookish and lame and a disappointment. I empathized with the boy (something we must all do before we can truly enjoy a story) and was fascinated by the Arthurian elements. But what does this have to do with anything like beholding oceans? I suppose because both my parents were mathematicians I did not think that literature was anyplace I ought to end up. My father was also an aerospace engineer who brought home pictures and articles on space vehicles and rockets. I remember looking at artists’ conceptions of the Apollo spacecraft and the Lunar Excursion Module while watching the Mercury launches on television. Nonetheless I was attracted to a different ocean. If we are to be happy we must find our own ocean and pursue it as best we can and hopefully one day we will behold it. For me the ocean I behold is a sea of stories. Dr. Richard Scott Nokes writes a blog, “Unlocked Wordhoard,” that I enjoy. He posted the above video to explain his interest in Medieval Literature and how that interest came about. Sharing a similar interest I found the video attractive but the important point it raises is not about the Middle Ages or even about literature, it is about finding whatever it is in us that motivates us, that gives us joy and satisfaction. We all need to consider what it is we are going to spend our lives doing. On the whole it is a pretty good thing if we can find a way to get someone to pay us for doing what we would do for free. If we must earn a living why not find a way to enjoy ourselves while earning that living. Elif Batuman in the introduction to her book The Possessed writes, “I stopped believing that ‘theory’ had the power to ruin literature for anyone, or that it was possible to compromise something you loved by studying it. Was love really such a tenuous thing? Wasn’t the point of love that it made you want to learn more, to immerse yourself, to become possessed?” This resonates with me as a teacher of stories, but it also resonates at a different level. We all need to find whatever it is for us that we can spend a lifetime loving, and whatever it is, it must be substantial enough to reward a lifetime’s effort. As a teacher it is important that I communicate to students who have little interest in what I teach the passion that motivates me to teach what I teach. It is not all about emotions, but than there is perhaps more to passion than emotion. Richard Feynman was at least as passionate about physics and the logic that is its foundation as I am about stories and their logic. Poltarnees may be a high and difficult mountain to climb, but it is wonderful thing to behold the ocean. I saw your blog via ‘google alert’ which I have set up to tell me when someone comments on Ariosto. You might be interested in my recent translation of Ariosto’s prose; at any rate, you will like the book’s cover! I did enjoy the cover. Thanks for passing it along. I will look into the translation. I was very interested in this blog. I think there were a lot of quality and important quotes that can be used by anybody as help in life. This blog reminded me a lot about some of Thoreau’s essay’s particularly the one titled “Self Reliance”. I think the music for this blog post also helped bring along the point in a unique way. I enjoy this blog for a few reason. One this blog raises a great question, is happiness really better then contentment and which pleases these emotions. I also enjoyed it because I learned Brittany is a place and about the Irish harp. I also enjoy seeing the influence that music has over people and their happiness. I can also appreciate the art of ancient times.